RITZENHOFF is the only glass manufacturer in Europe that is in the position to offer its customers complete services that include design through to glass production, a one-stop concept. 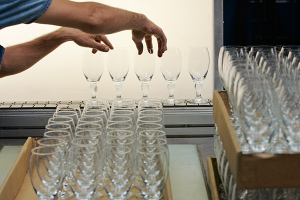 Our glasses are manufactured in Germany, and what is more on production lines that are housed by one of the most state-of-the-art glassworks in Europe. 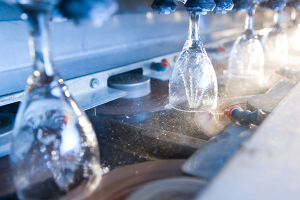 Flexible high-tech machines guarantee the exceptional RITZEN- HOFF quality, and they allow for the production of exclusively shaped glasses starting at 30,000 glasses per edition per year. 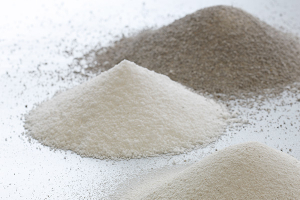 Like the primordial soup itself RITZENHOFF cooks glass porridge made out of glass sand, soda ash, calcium carbonate, potash and potassium nitrate at a temperature of approximately 1,500 degrees celsius. 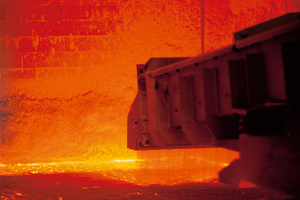 Four lines run parallel, ovens supply up to 90 tons of molten glass ‒ enough to produce more than 160.000 glasses per day. This glass does, of course, conform to the high requirements stated in the German Crystal Glass Characterisation Law. 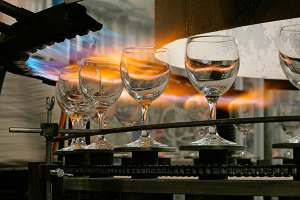 The liquid glass is portioned into drops and is shaped during the cooling process – pressed into stems, blown into glass cups, laser-cut, melted together. The finished glass, which undergoes numerous processes within only a few minutes and is shaped from red-hot glass drops, must meet the predefined requirements to a tenth of a millimetre before it is ready to be dispatched or goes off to be decorated. Innovative methods like, for example, rim processing using a laser or through the traditional process of “blowing and grinding”, complete the automatic production performance. 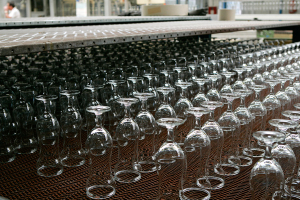 The trusted quality assurance is integrated within this process, for example the fill volume of bar glasses, indicated bythe calibration mark, must be very exact and may only allow for a three per cent deviation – one of the many quality features that each RITZENHOFF glass is subjected to before it leaves the production site. This system has been set up for use in continuous operation: the melted mass must not, at any costs, be allowed to cool down, so machines run 24 hours a day, seven days a week, and 52 weeks a year. They are operated in three shifts and monitored by qualified skilled workers and technicians. 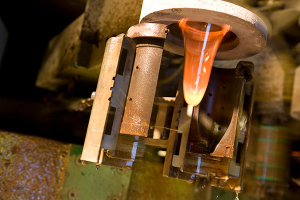 There is no standard machine for the production of glass. What does, in the first instance, appear to be a disadvantage has in the end turned out to be a technical plus: for the ongoing development of technology and procedures ensures that production is always state-of-the-art. In fact every time a tank or oven has come to the end of its journey (this is what the experts refer to as a life span of 6–10 years), it undergoes comprehensive renovation work, corrective maintenance, and technical renewals: this warrants the constant innovation process. 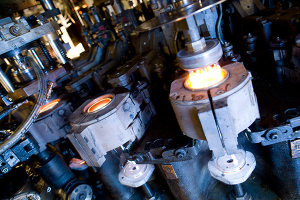 This helps to optimise the quality of the products, whereby machine wear and the use of resources is kept to a minimum. 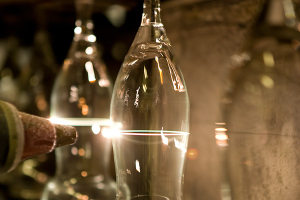 Despite all of this technology and perfection one thing is for sure: when a glass so fine and fragile is born from such a powerful melting process, the aura that envelops the goings on is simply magical.The production of cristal glass at RITZENHOFF is always up to date thanks to continual technological and processing development. During the production phase, RITZENHOFF can apply markings and brand logos and lettering onto cristal glass using a laser. Thanks to an intricate technical process, the foot of any glass can now also be produced without any seam and brillliant surface. 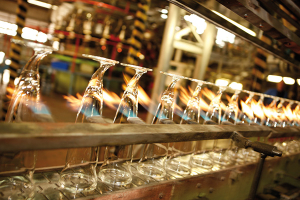 The production of cristal glass at RITZENHOFF is always up to date thanks to continual technological and processing development.